I am so proud of our faculty. 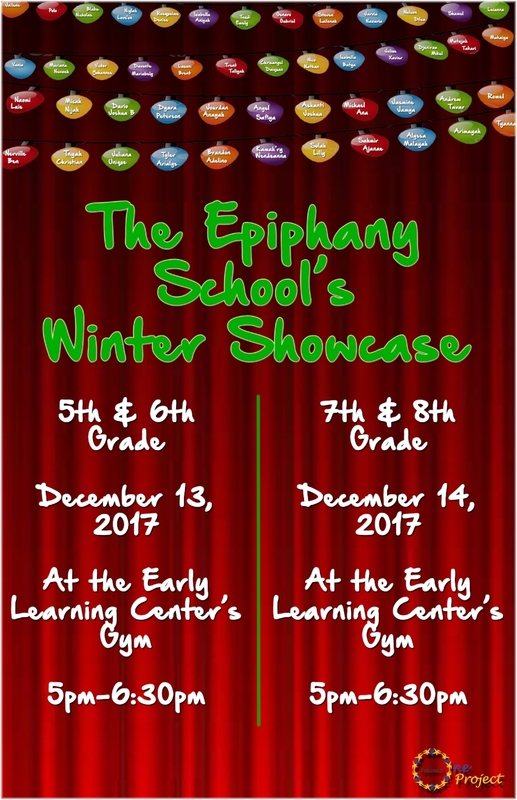 Every day, in a 1,000+1 ways, our teachers make Epiphany a special place for their students. They plan great lessons like creating boxes to retell the poignant story of Sadako or imagining an epilogue to Of Mice And Men by staging a mock trial in a real courtroom. They organize great fields trips like the recent one to the Museum of African American History for a thoughtful dialogue about race in America, and they create great extra-curricular activities like the Project Natural, the Brotherhood, and the Gardening Club. All this and more is described below, and friends like you make it all possible. Read on to hear about Rockland Trust, one of our great corporate partners, and learn about the wonderful support we have gotten from the teens in Jack and Jill. These folks are just like you. They recognize the promise and potential in these wonderful kids, and they’re prepared to roll up their sleeves to help. God bless them, and God bless YOU! Mauricio Burgos Lemus, Roberta Sousa and Nicole Casmir, our friends at Rockland Trust, joined us on November 16th to deliver a generous gift for the Graduate Support Program. (Thank you!) Their presence put a smile on everyone’s face, and we are so grateful that they are part of the Epiphany family. Mauricio Burgos Lemus, the manager of the Jamaica Plain Branch, also told our 5th graders about the Rockland’s terrific "Reading Makes Cent$" program, which offers students the opportunity both to increase their literacy level and to learn fiscal responsibility during their summer break from school by earning $2.50 for each book they read over the summer. The kids are eager to start the program! We are thrilled to highlight our partnership with Rockland Trust, a full service commercial retail bank located in Eastern MA and Rhode Island. Each year the Rockland Trust Fund invests over $1M in the communities in which they do business, and if you have the opportunity please let them know you appreciate their support of Epiphany. We are grateful for their generous investment in our students and families. Thank you, Rockland Trust, for being a partner in this work! The 5th Grade pictured with Mauricio Burgos Lemus, Roberta Sousa, and Nicole Casmir. On Sunday, October 16, Sahmir Russell, an 8th grade student, did a superb job of representing Epiphany at City Hall Plaza as part of a HUBWeek Boston panel moderated by Ally Donnelly (reporter with NECN and NBC Boston), Robin Organ (Executive Director at Project Green Schools), Chris Buchanan, (Director of Public Affairs at Walmart Foundation), and Valerie Sununu (First Lady of New Hampshire). With great pride, he spoke about the amazing things Epiphany does to stay “green” and environmentally sustainable. He spoke powerfully about the Cooking & Gardening Club and his love of cooking, especially when he and the rest of the club cooks for the entire school using the ingredients they grew, a monthly event. He also shared his dream of becoming a great chef! The crowd applauded his charm and intelligent humor, all while his mom, brothers, and dad beamed with pride in the audience. Because of his commitment to environmental learning, Sahmir has been invited to join the Green Student Council of Project Green Schools. We are so proud of Sahmir and congratulate him for being chosen as one of the inaugural members of this new youth council. Left to right: Ally Donnelly, Robin Organ, Sahmir Russell, Valerie Sununu and Chris Buchanan. Ms. Celius’s 5th grade class recently read Sadako and the Thousand Paper Cranes, a short novel by Eleanor Coerr. The students worked on presentations based on the novel and created boxes to tell Sadako’s poignant story. All the presentations were executed beautifully. The students presented their work with great pride, and we are proud of them. On November 16, Mr. Simon took his Reading Enrichment class to the Museum of African American History for “Race in the Public Dialogue” an event featuring Joy Reid, political analyst for MSNBC and host of “AM Joy,” and Jelani Cobb, Professor of Journalism at Columbia University and moderated by Callie Crossley, host of Under the Radar with Callie Crossley on WGBH Radio. The dialogue addressed the current social climate in the country with respect to race. This panel provided opportunities for people to engage in constructive dialogue about civil and human rights issues in the context of American History and its democracy. On October 30th, Steeve Joazard, English teacher at Epiphany and 2004 Epiphany graduate, took his 7th grade class to the District Court to enact their mock trial presentation of Steinbeck’s Of Mice and Men. Putting the brothers of the story on trial in a real courtroom invited deep reflection on the novel’s ambiguities and served as a civics lesson about the U.S. justice system. Students met Judge Tynes and clerks who work in the court, explored the courtroom, and through their presentations learned how a trial is conducted. This rich, immersive learning experience is a good example of ways we can enhance learning and support academic achievement. After visiting Epiphany last spring in connection with our “Project Natural” (a group where students learn about styling and maintaining natural hair), Whitney White fell in love with the kids and the Epiphany community, and she has recently returned to spread good cheer during the season of giving. Whitney is a Vlogger and has a youtube channel where she embraces her natural beauty and inspires women and men across the country. Stay tuned for the live stream on her youtube channel on December 9th from 9:00am-9:00pm! Whitney with two Epiphany Stars. On November 11, the Teen Group of the Boston Chapter of Jack and Jill of America donated 35 Thanksgiving baskets to Epiphany for distribution to our families who are most in need during the holiday season. Jack and Jill of America, Inc., is a membership organization of mothers with children ages 2 – 19, dedicated to nurturing future African American leaders by strengthening their children and those in their communities through leadership development, volunteer service, philanthropic giving and civic duty. Lori Britton’s daughters are active members and made the connection to Epiphany. Thank you!!! In addition to developing trusting camaraderie and team building, they are taught a variety of life skills to succeed—e.g., how to prepare healthy meals. They also take field trips (service and education related) to add more context to the themes explored in group dialogue sessions. For example in November they are going to Brandeis University to observe and be part of a college-age Brotherhood group, demonstrating for them the importance of building and maintaining positive relationships throughout life. Overall, the goal of the Brotherhood is for the members to learn and hone tangible life skills, and be united and supportive of each other throughout middle school and beyond.